Once shipped the amount of time it takes to reach you depends on the shipping method you choose when you place the order. Once shipped you will get a tracking number so you can track the shipment. All shipments are fully insured, and in the rare event of shipping damage or loss, Ram PC Systems will handle the claim process so that you don’t have to. If you need your system quickly we strongly recommend you do not wait until the last minute to place your order. Our build process begins when the order has been placed and paid for, so a problem with your credit card may delay your order. Backordered parts may also cause a delay to your order. Getting your order to you is a high priority to us. If we anticipate a problem, we will inform you when you place your order. The number of days to ship your system are counted in business days on our website. Weekends and US holidays are not counted on any timeline. 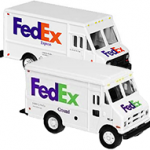 Ram PC System ships by FedEx in most cases. If you prefer to use UPS or another carrier we will do our best to accommodate you. If you are OUTSIDE of the USA please contact us directly for shipping charges as we can normally obtain a better international rate than our online shopping cart will calculate.